Depending on where you live, schools will be back in session soon! It’s time to start thinking about getting organized, finding school supplies, clothes, shoes, and book bags to start the year off right! 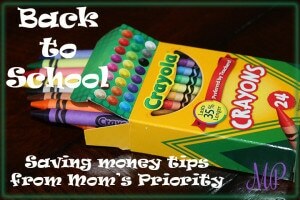 Mom’s Priority wants to help other moms find the best deals on the school supply list items, so you can spend less this year! Check out our school supply lists, and customize your own list for your needs! Compare between Amazon and Walmart. Order school supplies online and have them shipped to your door for free!! It is so much more convenient than scouring the Back to School aisles with all the other moms and their kids! Order online at Walmart.com and Amazon.com! Free shipping is available at Walmart.com when you spend $50 or more. If you are an Amazon Prime member, you receive free 2 day shipping on 1000s of items. Compare prices and if you can, spread out your shopping timeline. Online retailers and stores spread out their deals over the months of July and August. If you can, wait until after school starts to buy some items. You can often find deep discounts if you are able and willing to wait until after Labor Day.